Like a bad off-OFF-Broadway production, the so-called body of Bigfoot will be on tour this year. Perhaps another name for this post could be “Rick Dyer Strikes Again.” You remember Mr. Dyer . . . he’s the self-proclaimed professional Bigfoot hunter that pulled a dandy of a hoax back in 2008, touting that he shot a Yeti and was selling his body to the highest bidder. It didn’t take long to recognize a rubber ape costume from an actual mammal. Hmmm, I think vindication involves proving that you’re right about something. Lying to the world and trying to sell it to the bidder with the deepest pockets is more akin to perjury than being tragically misunderstood. 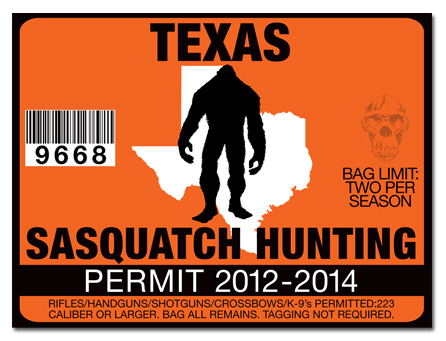 And although Mr. Dyer is getting some media attention, I think those of us that are serious about Sasquatch fear it’s more of “The Boy Who Cried Wolf.” And Texas may be one of the Top Ten states for Bigfoot sightings but I’d be surprised to find a Yeti in San Antonio where trees are short and scarce. These dudes like heavy-duty woods.